Two days without a post - I'm so ashamed. The problem is that nothing much is happening on the race or political scenes at the moment and nothing occurs to me historically. So I have been idly browsing my favorite blogs and news sites, looking for something to spark me off - and I found an unexpected subject on Rob Ijbema's Car-a-Day blog. Rob allows me to use the occasional photo of his paintings to illustrate my posts but it was not a picture that caught my eye this time. A couple of weeks ago he wrote a post on some models he made a long time ago. As can be seen from the photo up there, he does a brilliant job, but it brought back memories of my own modelling days. In the early eighties a friend and I used to meet after each GP and stage our own mini-GP using our combined Scalextric sets (slot racing). He was the track expert and would create very good replicas of each circuit, while I was the car man. Our big problem was that Scalex make very few models each year, so we had to create the grids with incorrect cars dubbed as the real thing. There was another slot car manufacturer whose models could be pressed into service but there were never enough and I found it frustrating that so many of our cars were pretending to be something else. That frustration finally got the better of me and I started making cars using sheet plastic and Scalex spares. 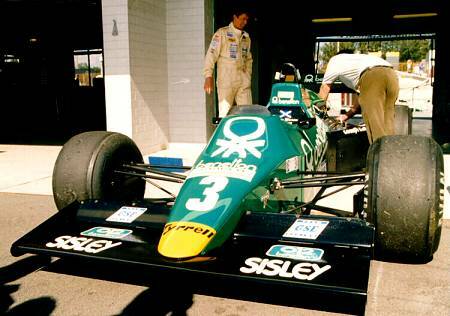 The first, the 1983 Tyrrell 011, was actually built using pieces cut from a kit of an ocean liner someone had given me (and had tiny portholes running along its undertray as a result!). To my surprise, it proved just as strong and performed as well as the Scalex cars and so I started churning new cars out as fast as I could. Along the way, I was learning what made the cars handle well or badly and eventually I could duplicate the performance of the real thing, so that we did not have the Osella team suddenly winning all the GPs. I became fanatical about visual detail, too, duplicating the colors down to the smallest advertising logos and painting the helmets in the correct designs. By the time everything came to an end, we were running two seasons, 1977 and 1984, on alternate weekends and about twenty of the cars were hand built. By then I was obsessive about detail and each car took longer to build than the previous one and so it came as a relief when we had to call it a day. But I can tell you that Nelson Piquet was the actual winner of our 1982 championship, not Keke Rosberg! My hands are not steady enough to make models well, but I had a friend that was particularly good at building Tamiya (not slot cars, just show piece) kits, creating them not to the instructions, but putting in pieces from other kits or ripped from other toys to create street-race compacts or low-riders. I'd love to see photos of your slot cars if you still have them. I like the idea of building a slot track (I grew up around a large HO train setup that belonged to my father) but I keep living in tiny homes, I don't know where I'd ever put such a thing. I did take photos of the models I made, Chunter, but left them behind in storage in the UK, unfortunately. Wish now that I'd had the sense to scan them into the computer because that's how I brought most of my stuff over - in a tiny flash drive. Computers are wonderful things and I would love to see some of your designs. I'd probably be doing that myself if this darn writing didn't take up so much of my time! I think you just put your finger on a difference between us, Way - I really don't like flying. It may be part of that being-in-control thing; I suspect I'd love it if I could do the driving. I am such a bad passenger! The Tyrell six-wheeler (mentioned elsewhere) was my finest moment - Or rather, it would have been had it not been for a flaw in one of the wheels. The lug that should have connected it to the rear axle was bent over at 90 degrees. I tried all manner of things to try and fix it. I sawed it off with a minihacksaw and hunted around for something to replace it. But itwas hopeless. The wheel lay beside the model on the shelf as a reminder for some time. Eventually I wrote off to Tamiya in Japan and explained the problem and enclosed the offending piece. (The english phrasing in the instructions of those models did require a little bit of understanding) and I did wonder if they would understand a simple letter from an 11 year old written in English requesting a spare wheel. Months passed and I forgot all about it. I gave up hope of geting a replacement part. Wow! The detail is incredible.. 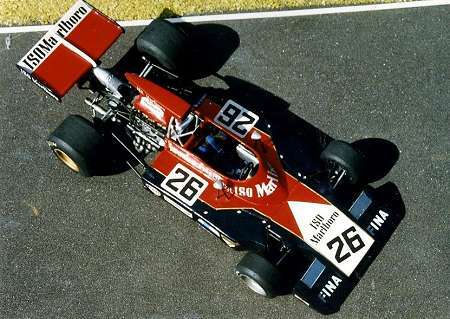 Rob Ijbema is one of the finest of F1 artists, Forrest, and his models were constructed for sale to the teams and drivers. Detail and accuracy are his hallmarks and it is a pleasure to see his handiwork. I don't make any models although I would like to try sometime but a guy in my class has made a couple from scratch. Check them out here at www.bernimodels.com. The page is in Spanish but you should still be able to find your way around to view the pics or use a webpage translator like Altavista to read about them. Those are excellent models, Corey - thanks for the link.